･Tracing the history of rock music, you will reach blues. Tracing blues, You will reach the world of country blues played on the acoustic guitar. Country blues has various styles and unique playings and is deep and fascinating genre which is completed as guitar solo music. In this book a lot of basic and advanced techniques are explored thoroughly with tab/music notation, the explanations and the CD (60-min/including 26 tunes). You can learn various fingerpicking guitar styles of the legendary bluesmen such as Robert Johnson, Mississippi John Hurt, Blind Blake, Gary Davis, Lightnin' Hopkins, Lonnie Johnson, Tampa Red and others. This is the MUST best-seller for acoustic guitar fans and blues fans. Chapter 2 <<Basis of fingerpicking blues>> Monotonic bass playing / Alternating bass playing / Mute of bass note / syncopation - Examples: "Will The Circle Be Unbroken? ", "I Want To Do Something For You", "Boogie Of Mance Lipscomb", "Hey, Hey", "Shuffle Of Lightnin' Hopkins","Blues In G Of John Hurt" and "Nostalgia For Avalon"
Chapter 3 <<Application of fingerpicking blues>> Delta blues / Ragtime blues / Sophisticated blues - Examples: "Blues In E Of Robert Johnson", "Blues In A Of Robert Johnson", "Pounding Blues Of Charley Patton", "Haunting Blues Of Skip James", "Rag For Blind Boy Fuller", "Slow Blues Of Blind Blake", "Blake's Stumbling Rag", "Tribute To Rev. 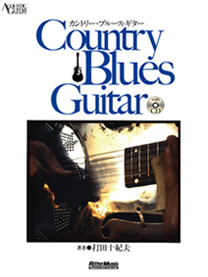 Gary Davis", "The Blues In My Fingers", "Blues In G Of Lonnie Johnson" and "Lonnie's Dazzling Blues"
Chapter 4 <<Bottlenec/slide guitar>> Basic knowledge of slide guitar / Slide control / Use of open tuning / Styles using chord positions mainly / Modal approach / Styles using fretting - Examples: "Bottleneck Rag Of Sylvester Weaver", "Tribute To Muddy Waters", "Dark Was The Night, Cold Was The Ground", "Evocative Slide Of Blind Willie Johnson","Things 'Bout Coming My Way", "Boogie Of Tampa Red" and "Crossroad Blues"
･Featuring a variety of alternate tunings: semi-regular tunings, open "chord" tunings, modal tunings, unison tunings, Nashville tuning and so on, you can learn various sounds of fingerpicking blues, country guitar, bottleneck/slide playing, Irish music, New age, etc. with tab/music and examples (recoerded in the 8cm CD / 15 tunes). Part 1 <<What is open tuning?>> What is "Open Tuning"? / History of "Open Tuning" / Function of "Open Tuning"
Part 2 <<Semi-regular tunings>> Drop D / Drop G / Other semiregular tunings / Examples: "There Will Be A Happy Meeting In Glory" and "Blues For Lonnie Johnson"
Part 3 <<Basic open tunings>> Open D / Open G / Examples: "Vestapol", "Amazing Grace", "Spanish Fandango" and "Jambalaya"
Part 4 <<Open "chord" tunings>> Open Dm / Open Gm / Open Dmaj7 / Other "open" chord tunings / Examples: "Crossnote Skippy Blues", "Sea Gull"
Part 5 <<Modal tunings>> D modal / G modal / CGDGAD / Other modal tunings / Examples: "Pretty Polly" and "Will The Circle Be Unbroken?" Part 6 <<Bottleneck/slice playing>> Basis of bottleneck/slide playing / Examples: "Blues For Tampa Red", "Tennessee Waltz" and "Tribute To John Fahey"
Part 7 <<Other alternate tunings>> Unison tunings / Other unison tunings / Example: "Four And Twenty" / Nashville tuning / Example: "Thanks To Stefan"
･This book is composed in order for beginners to learn surely and accompanied with the CD (99 tracks/60-min), which compensates some obscure points that you might have if you learn only with a book. "Tuning" which is a hurdle for beginners is explained with a CD so that everyone can make it. 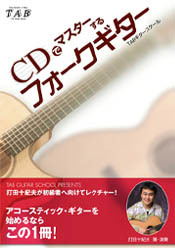 ･However, the examples in the end are the challenging guitar instrumentals in which various techniques are incorporated. The open high chords and chromatic playing are utilized for "Acoustic Delights". And the arrangement of "The Camptown Races" is used an alternating bass technique and the Carter family's picking featuring the melody. Part 4 <<Applied playing>> Chord appointing bass / Open high chords / Let add melody / Chromatic playing - Examples: "Acoustic Delights" and "The Camptown Races"
･"Ragtime" is by nature melodious and nostalgic black piano music which was very popular from the end of 19th century to the early of 20th century. 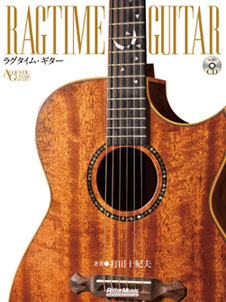 Also in acoustic guitar scene, it has uniquely developed as "ragtime guitar" which is based on its sounds and approaches. And today it has been established as fingerpicking solo music which we can play with one guitar. 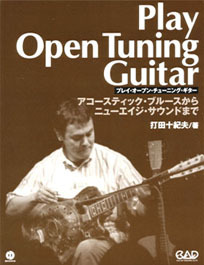 ･In this book, the styles of such "ragtime guitar" are classified into three section; <Folk Rags> where the traditional folk songs are featured, <Ragtime Blues> for which the country bluesmen's ideas are used and <Classic Rags> where the melodies of piano rags are arranged for acoustic guitar, and you'll learn the characteristic tunes in each of them. All of the tune are recorded on the attached CD (20 tunes). The tab/music for every tune is full scored with diagrams. You can learn "ragtime guitar" infallibly with the detail explanations, the comlete tab/music and the CD. Enjoy the world of challenging "ragtime guitar". *Also, we have the video version of "Ragtime Guitar"(Rittor-1004). It is effective to use both of the video and the CD-book!! 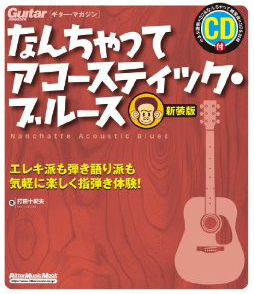 ･Tha author Tokio Uchida is well known for many best-selling instructional videos and books such as "The Essences of Acoustic Fingerstyle Blues Guitar", "Real Acoustic Guitar/Country Blues" and so on. Many people think acoustic blues is technically difficult. But rather acoustic bluesmen use various unique ideas for their playing. Tokio introduces them for this instructional book. The policy of this book is that we use take-it-easy approaches but we can creat serious sound. 32 ideas are introduced for this book. You can start from any page.